Now, let’s take a listen to a seldom heard vocalist, “Smilin’ Jack Smith, originally heard June 27, 1949 on the CBS radio network. In this post we have “The Jack Smith Show” as it was distributed to Armed Forces Radio Service stations as program 384 in the series. The show starts out with Jack singing “Let’s All Sing Like the Birdies Sing”. Also heard on the program are Martha Tilton and Frank De Vol and His Orchestra. 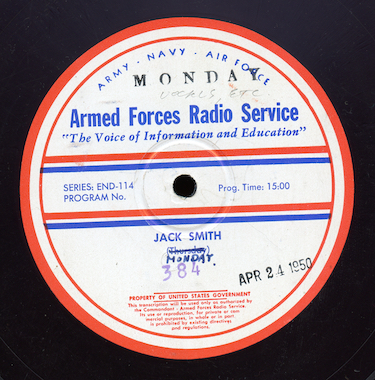 The program was digitized direct from an original 16” vinyl Armed Forces Radio Service transcription; the date is from the disc matrix.